Yesterday Jodi and I got together for a play date for Sam and Khali. And then we decided we could have dinner and some dessert together. Since adding one addition to each of our family’s, we don’t get to spend as much time together cooking/baking. And since Jodi had her pounds of strawberries, she got to make something with those. My meal was this Honey Garlic Chicken. I went to tell Craig that it was his turn to make dinner (Saturday night). He said ok, why? Well because I cook dinner every night and I’d like a break. He asked what he was making and I showed him this picture of the chicken. He sort of laughed. I knew I was just kidding. I’ve been looking forward to making this all week. And then even more excited to cook with my Two Girls Cooking buddy!!! Jodi had the dessert made prior to coming over. That post will follow this…no dessert before dinner!! But I will say they were good!! I did try one. No sugar didn’t count yesterday. Those were calling my name! Here’s a little look at the little ones at their play date. Toys weren’t the center of their attention. Sam (Jodi’s son) knows how to to put a movie on her iPad and watch it. I do believe I’ve had to call her once to ask her how to play movies and her son that’s not even two knows how!! I often wonder what we would have done back in the day with all of high tech toys we have today! I’m sort of glad we didn’t though. I get to enjoy them now!!! I think Sam was getting a bit upset with Khali because she would turn off the movie! But we had fun, they had fun and Sam loves to flirt with Brooklyn!! Ok, enough of the cute little ones, back to this chicken. I’m not sure how to put the flavor of this into words. It was good. It was really good. The sauce that you dunked the chicken in…..garlic, honey, soy sauce…ah-mazing! Best flavor. Best. Jodi and I were talking while the chicken was cooking in the pan…saying that the coating usually falls off either partially or sticking to the pan. But this didn’t. Craig is not a huge fan of sauce being poured over his food. He liked the way it tasted before I dunked the chicken in the sauce. He ended up with two pieces, with with and one without the honey garlic on it. He still preferred the one without. Not Jodi and me. I ate slow so that I could savor the flavor. Jodi finished off Sam’s food and I took the last piece continuing to put more sauce over it! We both said that we’ll make this again. This is a keeper for sure. I have many favorite different spices that I really enjoy. Fresh garlic is huge (which this sauce has in it), cilantro (the smell, to me is amazing). I love the smell of All Spice. But two that I can add to about any dish I’m making is nutmeg and ginger. The smell and the flavor it adds is awesome. The recipe called for thyme. That is my least favorite herb/seasoning. I don’t like cooking with it at all. So that one I did not add! To each his own right! We had some baked asparagus with Olive Oil and salt sprinkled over the top, some white rice (for the kids and Craig), some corn and a strawberry salad! This is one of the best weekend dinners we’ve had in a long time. Maybe it was the company!!! Here’s the strawberry salad we had with our dinner. Two Girls Cooking is always better than one! Cook over medium heat to soften the garlic but do not let it brown. Enjoy this chicken recipe. It’s great!!! One of the biggest reasons that I love eggs benedict is for the sauce. I was going to make it homemade, but I also knew that making these cups were going to take longer than I thought! Since I needed the sauce before baking the cups, I had to make it first. I didn’t make many changes or omit much from this recipe (with the exception of the tomatoes). 1 Heat oven to 350°F. Make hollandaise sauce as directed on package. 2 Meanwhile, spray 8 jumbo muffin cups or 8 (6-oz) glass custard cups with cooking spray. Separate dough into 8 biscuits. Press or roll each to form 5-inch round. Place 1 biscuit in each muffin cup, pressing dough three-fourths of the way up sides of cups. Place 3 Canadian bacon pieces in each biscuit cup. Spoon 1 tablespoon hollandaise sauce in each biscuit cup on top of the Canadian bacon. Place 1 tomato slice in each muffin up and top with another 1 tablespoon hollandaise sauce. 3 Bake 25 to 30 minutes or until muffin edges turn golden brown. 4 Meanwhile, in 10-inch skillet, heat 2 to 3 inches water to boiling; reduce heat so water is simmering. Break cold egg into custard cup or small glass bowl. Holding cup close to water’s surface, carefully slide egg into water. Repeat with 3 more eggs. Cook uncovered 3 to 5 minutes or until whites and yolks are firm, not runny. Remove eggs with slotted spoon; cover with foil to keep warm. Repeat with remaining 2 eggs. 5 Place 1 poached egg on each biscuit. Spoon slightly less than 1 tablespoon hollandaise sauce over each egg, and top each with 1/4 teaspoon chopped chives and salt and pepper. Run small knife around cups to loosen. We ate this with Turkey Bacon and a Tropical Berry Smoothie (bananas, mangos, pineapple, and peaches mixed with no sugar Breyer’s Vanilla Ice Cream and skim milk). This is a great way to get our fruits in for the day and enjoy something sweet that’s awesome tasting! These ego benedict cups were so good. Yep, we had them for dinner! I keep saying that we’ll try these again some day. And I know that we will, but I’ve been adding many new things to our weekly menu that we don’t have much of a chance to have do overs! Which is a good thing! Happy Cooking and enjoy breakfast for dinner. Though the original version of this dish has ample amounts of oozing butter, this version doesn’t have any butter in it at all, and it still tastes great. Pay close attention to the cooking time so the chicken doesn’t dry out, and prepare the sauce 2 hours ahead of cooking time. Recipe courtesy of Now Eat This! : 150 of America’s Favorite Comfort Foods, All Under 350 Calories by Rocco DiSpirito/Ballantine Books, 2010. I made a few simple changes to the recipe because I’m not just trying to lower my caloric intake, but more so to lower my fat intake. So instead of the swiss cheese, I used reduced fat Mozzarella cheese. I also used the fat free evaporated milk instead of low fat skim. So the values below could be much lower due to the cheese alone!! In a small saucepan, whisk the evaporated milk into the cornstarch. Bring the milk mixture to a boil over high heat, whisking constantly. Reduce the heat to low and continue to cook until the mixture has thickened, about 1 minute. Then whisk the cheese into the sauce until it is melted and smooth. Whisk in the chives, and season the sauce with salt and pepper to taste. Spray an ice cube tray with cooking spray, and divide the cheese sauce equally among 8 of the cube holes. Freeze the cheese sauce until it is hard, about 2 hours. 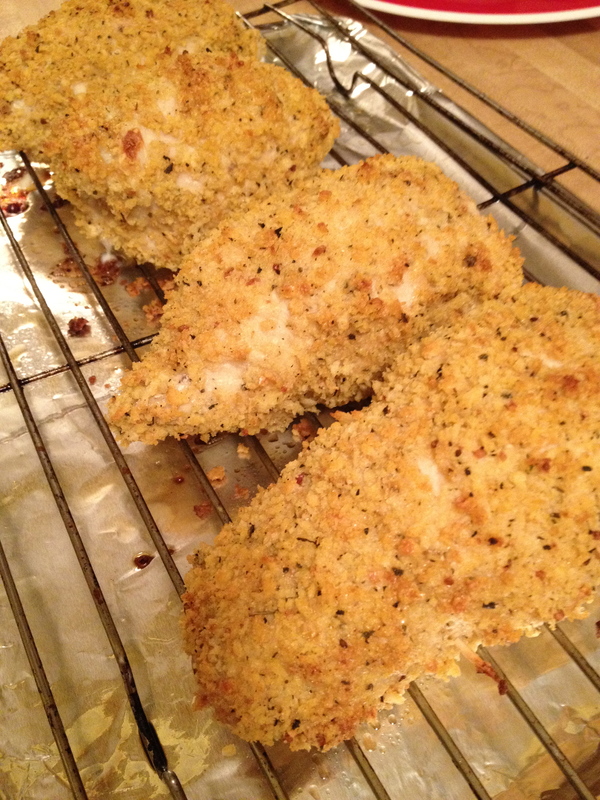 Lay the chicken cutlets on a work surface, and season them with salt and pepper to taste. Arrange the ham slices over the chicken. Place 2 frozen cheese cubes in the center of each piece of chicken. Roll up the chicken to encase the filling, and secure each package with 2 toothpicks. Put the flour in a shallow dish. Place the panko in another shallow dish. In a medium bowl, whip the egg whites with a whisk until they are extremely foamy but not holding peaks. Working in batches, dredge the chicken bundles in the flour, shaking off any excess. Dip them in the egg whites to coat completely. 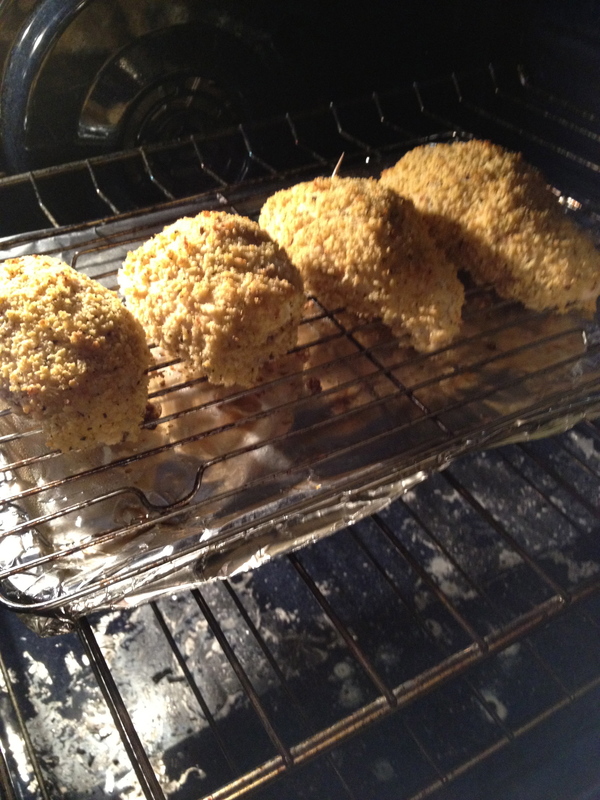 Then dredge them in the breadcrumbs to coat completely. Place the chicken bundles on the wire rack. Spray the chicken lightly with cooking spray, and season with salt and pepper to taste. 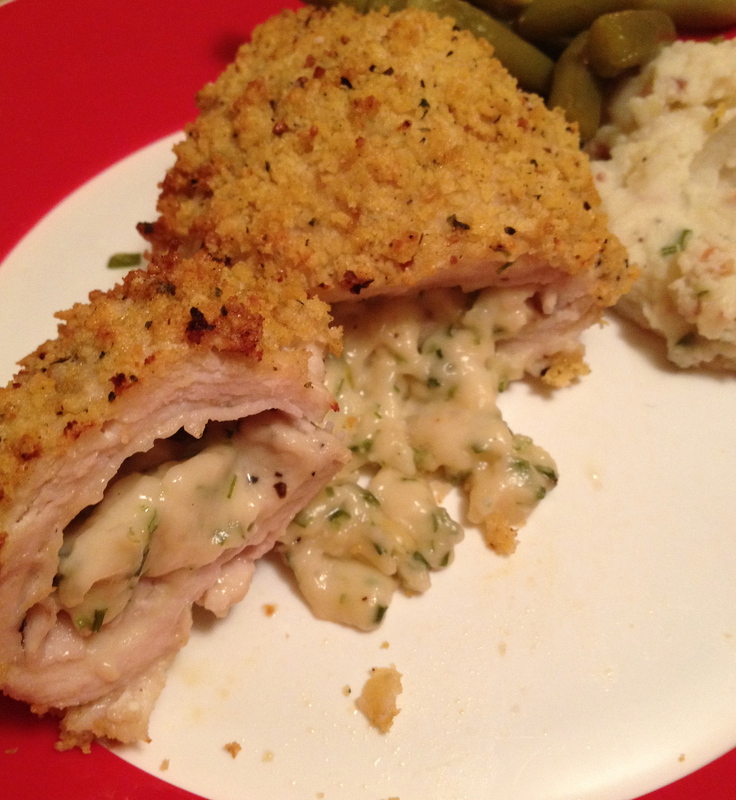 Bake until the breading is golden brown and crispy outside and the cheese sauce is fully melted, 25 to 30 minutes. Serve hot. My finished picture doesn’t compare to the one they show online. Of course I’m no professional photographer and I am using my iPhone 4S for the camera! But it was pretty good. Don’t pass this one by. Have a great rest of the week. And know that just because it’s made with “heathier” replacements, doesn’t mean it’s not good. I haven’t gone wrong yet.